Sridhar Dhanapalan is giving a talk next week about OLPC Australia, pitching it as “Australia’s toughest Linux deployment“. It certainly is that. He notes their aim to reach each of the 300,000 children and teachers in remote parts of Australia, over the next three years. OLPC Aus­tralia aims to cre­ate a sus­tain­able and com­pre­hens­ive pro­gramme to enhance oppor­tun­it­ies for every child in remote Aus­tralia… by 2014. [T]he most remote areas of the con­tin­ent are typ­ic­ally not eco­nom­ic­ally viable for a busi­ness to ser­vice, hence the need for a not-for-profit in the space. This talk will out­line how OLPC Aus­tralia has developed a solu­tion to suit Aus­tralian scen­arios. 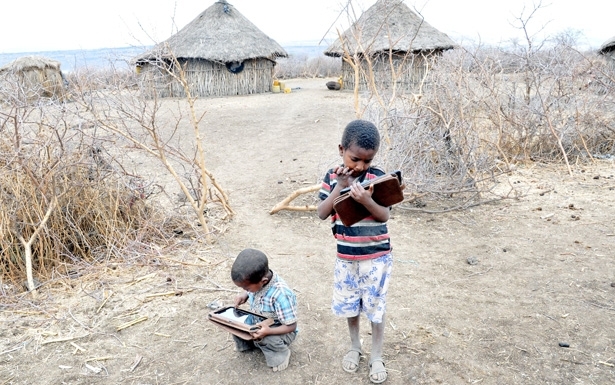 Com­par­is­ons and con­trasts will be made with other “com­puters in schools” pro­grammes, OLPC deploy­ments around the world and cor­por­ate IT projects. By pro­mot­ing flex­ib­il­ity and ease of use, the pro­gramme can achieve sus­tain­ab­il­ity by enabling man­age­ment at the grass-roots level. The XO laptops them­selves are… repair­able in the field, with min­imal skill required. Train­ing is con­duc­ted online, and an online com­munity allows par­ti­cipants nation­wide to share resources. Key to the ongo­ing suc­cess of the pro­gramme is act­ive engage­ment with all stake­hold­ers, and a recog­ni­tion of the total cost of own­er­ship over a five-year life cycle. We’re hosting an olpcMAP discussion session at our Cambridge HQ on Wednesday night, with students (and future collaborators!) from Tufts. If you can’t be there, catch up on recent additions and developments to the project with this month’s olpcMAP update. Meanwhile, mapping maven Nick Doiron shares the view from his seat in Montevideo, where he is a resident hacker this month with Plan Ceibal.